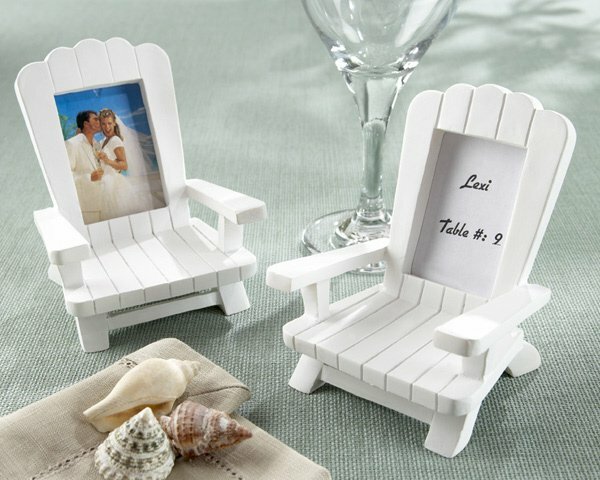 Beach themed weddings and outdoor events are the perfect place to use these adorable miniature Adirondack chairs. They do double duty as place card holders and beach chair picture frames where they can display some ocean memories in their own homes. Chairs are crafted of polyresin and handpainted white. They are 3" by 2 1/4" and hold a 1 1/2" by 1 1/4" photo or place card (inserts not included). Favors are sold in a set of 4. Can you paint these a different color yourself if you choose?? I'm sorry this item can't be personalized, you will receive a white Mini Adirondack Beach Chair Place Card Frames as pictured but you can paint it with any color if you want.